The Stacker is a microplate handling system designed for rapid throughput and integration with the microplate readers from BMG LABTECH. 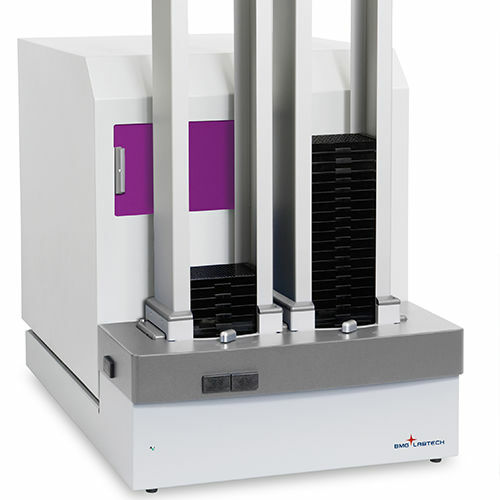 The Stacker provides unloading, loading, restacking and continuous feeding of a maximum of fifty microplates. The reader is controlled via ActiveX interface or a DDE, and the stacker is controlled with a serial interface. The Reader Control Software defines the measurement protocol and the configuration of the reader. Batch operation information can be defined by the user. This includes information such as the number of microplates and test name. Script mode provides users with flexibility, as it allows them to write their own scripts. Various test definitions for different plates in a single batch run can be chosen with the use of the script mode function. The Stacker can also be used to read barcodes from different positions on the microplate.